The cookbook may soon go the way of the dinosaur, and if that’s true as some trend watchers predict, it’s time to take a closer look at the tools we need to tell a succulent food story in the 21st century. In the March 24 issue of the New York Times, technology writer Sam Grobart looks at where technology could replace "old school" items, and while he believes that traditional books are still worth hanging onto, Grobart predicts that printed cookbooks will quickly give way to digital content. Why? Because a well-produced cooking app does what a cookbook cannot – provide a better version of everything that came before it. 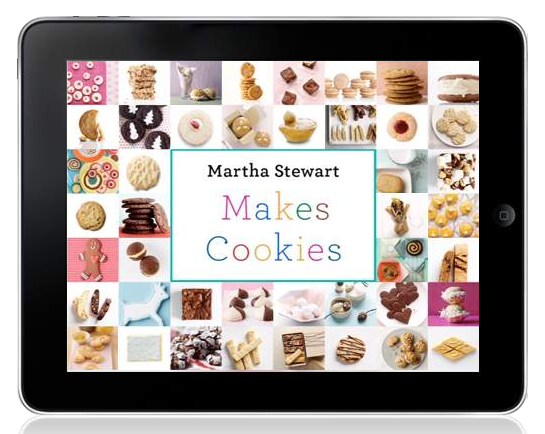 Grobart cites the new Martha Stewart Makes Cookies app for the iPad as the wave of the future. Every recipe has a photo of the dish, which is now a luxury that is too expensive for many printed cookbooks. Complex cooking and baking techniques are explained with embedded video. The app also features a digital timer built into the recipe, and an ingredient list you can email yourself to take to the supermarket. Martha has figured out how to "build a better mousetrap" by visually upping the game for instructional cooking content. She’s also got apps in the works for cocktails, smoothies and power foods. Chefs like Tyler Florence have gotten into the app game too, offering access to a staggering number of recipes at minimal cost, and new features the Joy of Cooking could never do, like real-time email consultation for all your cooking issues with a trained chef. Martha is also launching new versions of her flagship magazines for the iPad. The stalwart "Martha Stewart Living," which was always a luxury experience in print, has now become a living, breathing magazine experience for the tablet with music, rich motion graphics, and instructional videos that will convince you it is simple to prepare a four course meal in under an hour. The iPad launch was quickly followed by "Everyday Food" and other MSO publications. Are we delivering content and insights the consumer can’t get from any other source, be it digital or traditional? Are we using color and motion to create a fresh and lively virtual food experience for the consumer? Is the experience "drool worthy?" Have we expanded the consumer’s knowledge of sourcing information? Have we used technology to transport the consumer to a location – be it a farm, a processing facility, or a kitchen – which they might never be able to visit on their own and enhances their understanding of the product? Have we introduced them to the people behind the food product? Is the talent/storyteller the proper fit for each platform, topic and message? Do their credentials need to be transparent? Are we providing indispensable advice, creating a must-have resource for the consumer? Have we used visuals and video to make food preparation come to life, illustrating not just assembly, but cooking techniques the consumer can master? Do we have a proper distribution strategy? Tom Barritt talks with Marc Matsumoto, the creator of the blog No Recipes about what makes compelling blog content and how to build an audience with bloggers. We already knew that chefs were becoming more outspoken (e.g., David Chang), but Julia Moskin in the New York Times reports that Twitter is the new megaphone for many embattled chefs. More here about chefs venting on Twitter. Is a group therapy session (in 140 characters or less) the next big thing? The Most Social Brands of 2009 in Food and Beverage? The social media management company, Vitrue has just released its list of the Vitrue 100: Top Social Brands of 2009, and representation from food and beverage companies is surprisingly small. Vitrue defines "the most social brands of 2009" as those which actively used blogs, social networks, video, mobile networks and microblogging to communicate with their audiences. Of the top 100, Starbucks is listed first in food and beverage at #11. Starbucks was rated #6 in 2008. Following Starbucks in order are Coca-Cola #31, Nutella #42, Red Bull #47, Subway #50, McDonalds #62, Krystal #63, Skittles #65, KFC #66 and Pepsi #73. In terms of overall companies, IPhone, Disney and CNN took the top three spots in the Vitrue 100. Following along the lines of popular Twitter apps, Friedland has aggregated – on one site – live Twitter feeds from the world of food, and promises content that is “from the delicious to the disgusting, the poetic to the profane, and the serious to the silly.” Gastrobuzz provides a quick and easy way to see what top food voices in the world of food are talking about. The site includes feeds from chefs, personalities, bloggers and more. In fact the initial feed of luminaries includes everyone from Food Network’s Paula Deen to food policy activist Marion Nestle. Friedland says the list is a work in progress and will continue to expand and evolve. He has even coined a new phrase, “the gastrosphere” in describing the conversation that he’s aggregating. You can follow the feed via the Gastrobuzz site, or the Gastrobuzz list on Twitter. Gastrobuzz also takes recommendations for food-themed Twitter feeds the site should follow. The best way to understand what a food blogger wants is to have a conversation. In recent months I’ve had several opportunities to talk one-one-one with food bloggers,and each time I come away with a new idea or a fresh insight. That’s the amazing world of food. Someone is always stirring the pot and creating something new. So, it felt like a banquet of delicious dialogue when I served as moderator for panelists Josh Friedland of The Food Section, Sara Kate Gillingham-Ryan of Apartment Therapy: The Kitchn, Karen Hochman of The Nibble and Kat Kinsman of AOL FOOD/Slashfood at a Public Relations Society of America New York Chapter "Meet the Media" event on October 21. Their websites and blogs embrace topics as diverse as the rituals of cooking, fine foods, quirky pop food culture and breaking news. And, they had a lot to say about the ascent of the blogosphere, working with PR professionals, the death of Gourmet magazine and the hottest food trends to watch. Did Blogs kill Gourmet Magazine? A picture is worth a thousand words. And when it comes to food blogs, a beautiful photograph that accompanies a post can make all of the difference. Great photography entices an audience – and keeps them coming back for more. I am a digital photography enthusiast. On the weekends, I always have my Nikon D70 SLR with me and my favorite subject to capture, besides my son, is food (the photos in this post are a few of my best shots to date). Needless to say, I was thrilled to have the opportunity to participate in not one – but two – photography classes at the BlogHer Food conference in San Francisco this past weekend. I particularly enjoyed the class taught by Heidi Swanson of 101 Cookbooks and Matt Armendariz of Matt Bites – both very talented photographers with great food blogs. For anyone who is looking to constantly improve their photos (like myself! ), Heidi and Matt shared the following very useful tips. 1. Be inspired by others. – Constantly read and review food and travel magazines (especially ones from Australia), cookbooks, food photographer’s websites and beautiful food blogs. Create either a physical or online scrapbook of favorite photos. The incredible San Francisco food photographers that inspire me include: Noel Barnhurst, Richard Eskite, and Deborah Jones. – The best time to shoot photos is either dawn or dusk. I always prefer dusk, otherwise known by photographers as “The Golden Hours.” Bright sunlight during the middle of the day is always the most difficult (outdoor light is just too bright). – When you frame your photo, think about it in context of negative or positive space. Do you want to construct a very simple image with a single focus or a complex image with a lot going on? – Food shots almost always looks best in color, but consider shooting people enjoying food in black and white. – Are you shooting indoors or outdoors? In a dark restaurant or outside in a garden? Determine what mood, color and lighting you going for, and adjust your camera’s setting accordingly. 6. People or hands in your shot? – Adding people or hands with your food shots can add a different, interesting dimension. – While most photographers, including myself, typically prefer to shoot only in natural light, a flash creates a whole new look-and-feel to a photo. Blogs mentioned during the class that feature beautiful photos included the Sprouted Kitchen , Vegan Yum Yum and Tartelette. One of my personal favorites is Becks & Posh, which always features simple, gorgeous shots. o What size will they be? Do you want a vertical or horizontal shot? o Ingredient shot? People shot? In-process shots? Ready-to-eat shot? – When using a point-and-shoot camera, always shoot in AV mode (not “automatic”). o Matt recommends the Canon G10 as a great point-and-shoot camera. So after receiving excellent tips from two great photographers – I am inspired to continue to push myself with my own photography. I want to get to know my camera better, experiment with flash and black & white photography, try more “in-process” shots, use my tripod more and focus on the post-production process. All challenges which I plan to embrace with open arms, eyes – and a digital lense. Former New York Times Food Editor Amanda Hesser and freelance writer Merrill Stubbs have launced food52, an online community that celebrates the home cook. Hesser and Stubbs will curate a database of original recipes that they promise will be more useful and trustworthy than other recipe sites, given their credentials. The duo will also write a daily food blog sharing recipes and videos, promote favorite food blogs and highlight the work of new chefs. A key outcome of food52 is the creation of the first crowd-sourced cookbook. The site will host weekly recipe contests for community members, with Hesser and Stubs selecting the finalists. The food52 community will vote to determine which recipes go in the book, and will help select title and creative elements for the cookbook. The first cookbook will be completed in 52 weeks. The move is indicative of established food writers embracing the online world and leveraging all the right elements. The creators of food52 clearly understand outstanding food content, and they’ve defined exactly who their online stakeholder is. But, they’ve taken their effort a step further. Beyond offering a credible, reliable resource, they’ve added an element that is often missed. Hesser and Stubbs offer community members a clear incentive to participate in building something bigger with the creation of a cookbook — and a reason to return to the site on a weekly basis. This level of “vesting” of community members will be crucial to the success of food social media sites in the future. There’s certainly something to be said for the format. The videos are breezy, conversational and ripe with personality and entertainment value. And, there’s the potential for a whole different connection when you’re hearing the reminiscing coming straight from the food blogger’s mouth. Call me old school, but I have to take a minute to mourn the idea of one more nail in the casket of the written-word. There is something to be said for reading a food blogger’s reflections and getting inside his or her head. There’s also the mystique factor. Who is this person, and why do I connect with their storytelling style and their personal philosophy about food? Of course, there were probably plenty of naysayers when Julia Child took to the airways, and that event certainly did not signal the death of the cookbook. Personally, I hope there is still plenty of room for both formats, as food bloggers share their collective passion for food.